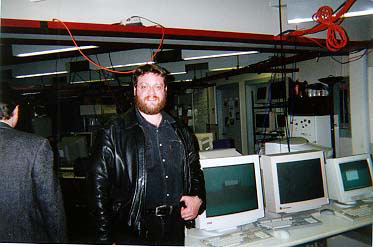 I was first introduced to the area of wearable computers when I visited the MIT Media Lab in Boston in 1995. This visit was by invitation of Mr William J Mitchell (dean of Architecture and Urban Planning at MIT) who had visited Melbourne and RMIT that year promoting his book 'City of Bits'. I met Steven Mann and Thad Starner on this visit at the Software Agents Group section of the Media Lab. Both Mr Mann and Mr Starner had developed different approaches to the idea of wearing the computer on the body. Wearable computers are small, usually hand assembled computers, powered by rechargeable batteries. They are most often set up to deliver text-line interface information to a head mounted display which the wearer uses for data output instead of a monitor. Input to the computer is provided by a chording keyboard, which enables the user to input commands single handedly. Wearable computer users are not immersed in a virtual reality, rather information augments the world around them, information appears superimposed over the real world. Wearable computers and Augmented Reality offer ways to further examine the complex inter-relationship between real and virtual space. These technologies to a large extent invert the paradigm of representing space on a flat screen, instead enabling information appear to permeate and interact with physical space itself. In 1998 I won a scholarship to formally attend the MIT Media Lab as a visiting scholar, and while there developed 3D signage which was designed to be used with Augmented Reality applications. I worked with Karrie Karahalios on the "Diorama" project. I was introduced to Karrie via Thad Starner, a key researcher in the field of wearable computers and augmented reality. The theme of EMU is the inter-relationship between urban space and electronically mediated communities. The area of wearable computers ties in with this broad theme, as these customised small portable and 'always-on' computers enable the user to fully engage with the space around them and to annotate that space with information pertinent to it, and while doing so, communicate with other "Cyborgs" (as wearable computing aficionados refer to themselves) via wireless local area network cards. 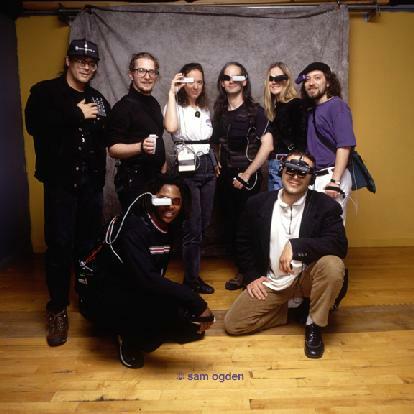 Wearable computing researchers at MIT Media Lab circa 1997, second from the left (standing) is Thad Starner who introduced me to Karrie Karahalios with whom I collaborated on the Diorama project. Mr Starner also provided me with key information which led to experiments in developing a simple laptop based wearable computer at RMIT's "I Cubed" facility in Melbourne . I am still continuing these experiments; using a head mounted display with laptop computers and observing how this type of computer usage differs from regular laptop use in terms of negotiating urban space and discovering how computer use while in motion through cities affects the types of media possible and desirable from the interplay between being both online and in the 'real-world'. 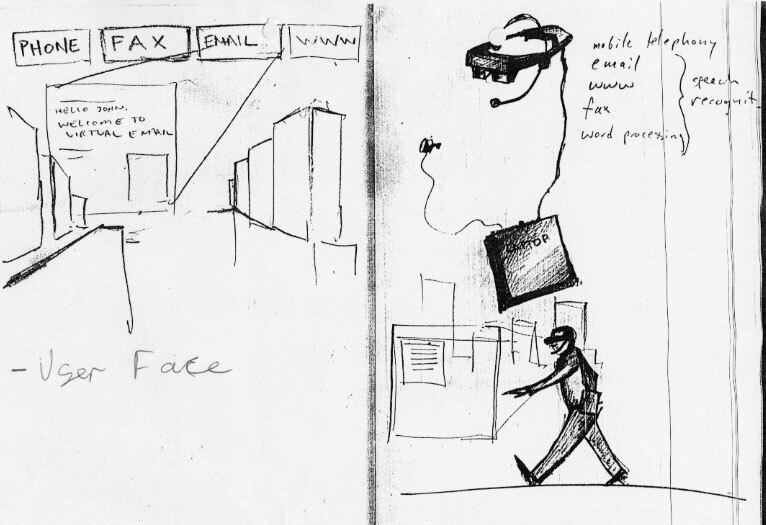 In addition, experiments using wireless cameras for 'personal imaging' while drifting through urban space. The urban strechnology kit, developed by my partner Molly Hankwitz and I are directly linked to notions of mobile media usage as pursued by the wearable computing group at MIT. There are inter-related themes which emerge when considering the possibilities of augmented reality - these have to do with the role played by media where digital content can be dynamic, reflecting changing aspects of the environment, or one's relationship to it. MIGRATION - the constant moving from one place to another by the user of a wearable computer means that the act of moving itself can be the basis for certain types of digital media which are dynamic - an example is the windmill which slows down and speeds up depending on the rate of data traffic in Karrie Karahalios' Diorama project. Although not a wearable computing project, this application was an example of basic augmented reality. SPACE - that geospatial area occupied by the user as s/he undertakes daily tasks while using the wearable computer. Terrain traversed, land covered, urban space negotiated. There are several types of space which augmented reality gives rise to, that of i) the information, that of ii) the environment, and a third type of space which is the iii) conceptual intersection of the physical, the informational and how they work together in the mind of the user. 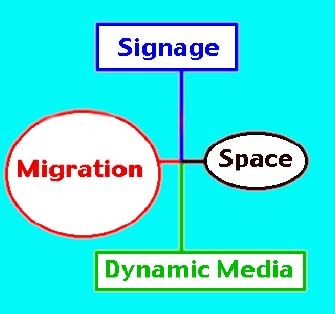 DYNAMIC MEDIA - media which update, refresh and present themselves in the context of constantly shifting environmental conditions e.g. a directional sign which constantly points to the way point desired. Promotional video starring Alan Alda demonstrating a wearable computer with an augmented reality application. Thad Starner discusses in this video sequence the range of applications wearable computers can make possible. Included in this sequence is an impressive demonstration of a "sign-language translation system" built into a baseball cap which 'reads' the sign language gestures of the user and translates them rapidly into spoken English. Power point slides also list the attributes of wearable computers. The contents of these slides are here. I was first introduced to wearable computers on my first visit to the MIT Media Lab in 1995.While there I met Steve Mann and Thad Starner,both of whom were involved in developing computers designed to be worn on the body, and connected via wireless network to others likewise 'wired'. Professor Steven Mann, a pioneer and one of the guiding principles behind the wearable computer is a major advocate of computer recycling – that is making use of obsolete computers in order to turn them into devices that empower people against the interests of the corporate mainstream. He strongly advocates the use of laptops which otherwise would be thrown away as wearable computers, as well as such devices as the eyepieces of video cameras as displays for wearable computers. Much of his work revolves around exposing the one-way nature of corporate surveillance for example, and his personal vision experiments are often also forms of agitational propaganda, which seek to underscore the right of the individual to privacy, to fair treatment at the hands of the law. He and his students often take part in demonstrations in order to expose and record (in real time) evidence of police brutality. He has gone on public record opposing the use of wearable computers as part of for example, military uniforms. His stance is consistent with the idea of social ecology – the creation of a climate of social exchange amenable to the development of communities from the ‘ground-up’, rather than the hierarchical/consumerist model on offer from most corners of the global economy. He is also an almost obsessive opponent of the reduction of public space as a result of the influence of the retail sector in our contemporary cities. His anti-corporate line is in stark contrast to the corporate vision of technological determinism, which would only privilege the very latest technology, and only that which can advance the creation of money. His politics got him into trouble at MIT Media Lab, where many saw his use of personal imaging technology (i.e. being online while streaming video of everything he saw) as a direct challenge to the privatised notion of intellectual property as largely espoused by the corporate backed lab itself. I met Steve Mann at MIT Media Lab in 1995 and it was largely following my meeting with him that I took an interest in the area of wearable computers, augmented reality and related fields. I was very impressed by his humanitarian and largely non-commercial worldview and his interest in adapting wearable computers in order to aide the handicapped. There are thus forms of technology of personal empowerment that directly defy the anti-environmental, techno-determinist stance of big business. By empowering people with tools of self-education such as wearable computers and related technologies people can thus further understand the delicate nature of interconnected urban phenomena and events in ways not prepared for them by those in power. The city is customisable, sharable, open to interpretation, and thus by extension so is the social contract itself. Augmented reality technologies are a large part of modern warfare. In contrast to this model, Professor Steven Mann has argued the case for a model of research based around the idea of ‘existential computing’ which actively seeks to extend the capabilities of the user, rather than enable a conduit for the influence of centralised institutions. He argues the case for a type of approach to wearable computing and personal imaging which actively resists the notion of computer as work device. It is possible to consider the personal and community empowerment potentials of a technology without the military overtones of that technology influencing aimed-for progressive outcomes. The military applications of wearable technology tend to stress telemetry and the tracking of troops in the field; the ‘smart uniform’. This is very much a top-down hierarchical model, where the individual is subordinated totally to the broader tactical and strategic demands of the theatre of war and those that manage it. But If the enemy is within -- within our own hearts, and within our collective selves, we must equally consider questions like "What if terrorists infiltrated positions of high authority or power?" and "How can we defend our nation against terrorists operating from within the military? ".